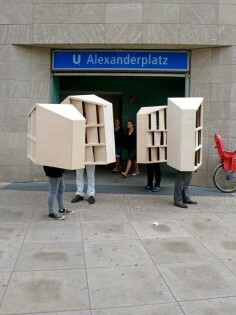 ‘walking berlin’ – houses socializing with the locals image courtesy fantastic norway ‘walking berlin’ by fantastic norway was an event created as part of the dmy berlin design festival 09.
the walking houses are man-sized models of our latest architectural project: a tourist destination located on the northern west coast of norway. as their project depended on the idea of travelling, they decided that it was only fair that the houses got to do some travelling too! while exploring the streets of central berlin, the walking houses chatted with the locals, danced at alexanderplatz, travelled on the u- bahn, and even shared a curry-würst with the berliners! Fantastic Norway ist tatsächlich fantastic! Zufällig liegt die aktuelle Ausgabe von Zuschnitt auf meinem Schreibtisch. Nanu, als Holzhäuser verkleidete Berlin-Touristen auf Leihfahrrädern der Deutschen Bahn? Fantastic Norway was was founded by Håkon Matre Aasarød and Erlend Blakstad Haffner in 2003. In the 10 years to come the architectural studio was engaged in building design, mobilization and participation processes, development strategies, writing and television production. The primary ambition of the studio was to create an open, inclusive and socially aware architectural practice and by that contribute to re-establishing the role of the architect as an active participant in – and a builder of society. Fantastic Norway’s credo was: “Every town is different; every place is in some way fantastic. We aim to embrace this fact and through dialogue transform it into architecture”. The heart and soul of the studio was a bright red caravan. Combined with media coverage and a variety of essays in the local newspaper, the caravan functioned as a meeting point and a mobile platform for architectural discussions, debates and workshops. Fantastic Norway gathered ideas, suggestions and stories from the communities they worked in and utilized this collected knowledge in the design process. This inclusive way of designing anchored their projects locally and created a personal relationship between the proposed architecture and the people affected by it. As a supplement to their ambulant practice, Fantastic Norway stimulated to broad public awareness of architecture with more than 60 articles and essays in local newspaper in addition to several spacial installations and stunts. In 2011 the partners Aasarød/Haffner hosted a television series of 6 episodes á 29 min for NRK (Norwegian Broadcasting Corporation) aiming to arouse a broad public interest and curiosity for the field of architecture and planning. After 10 exciting years of fantastic adventures, – people and – projects, the caravan was finally parked in december 2013.